The consumerization of IT is extending to mobile apps. It’s time to embrace it in your organization. As consumers, our mobile devices and apps connect us at any moment to a universe of information never before possible. But what happens when we go to work? Employees now expect the same kind of consumer-level mobile app experiences to help them do their jobs. 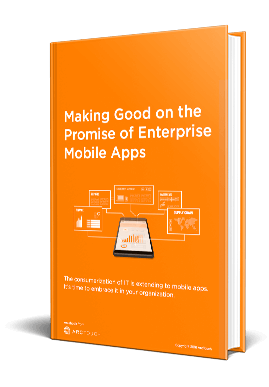 In this ebook, we’ll address the consumerization of enterprise mobile apps and the three trends converging to create an enormous opportunity for companies to build powerful, intuitive apps for their workforce. Employees are bringing their own devices and apps to the workplace and using them to boost their productivity. New development platforms are making it much easier to integrate apps with enterprise data systems. From lockdown to embracing new opportunities, IT’s role in mobilizing an enterprise workforce is shifting.